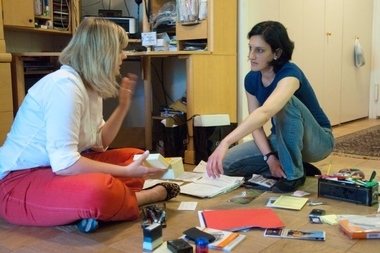 Maeve Richmond, of Maeve's Method, helps Nicole, a public speaking coach who lives on the Upper East Side, get her desk area organized before fall. 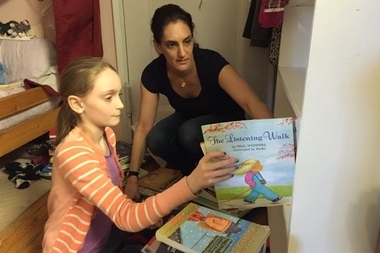 MANHATTAN — An Upper West Side mom needed some help getting her house in order and wanted to feel more organized before her kids started at a new school, so she called Maeve Richmond for help. Richmond, the founder of Maeve's Method — which teaches a do-it-yourself home organization method through home sessions or video coaching — recognized that the mom needed to "ground herself," so she helped the mom find her desk. Literally. After the summer, the woman's desk was filled with papers and travel bags. She needed to clear them off, and, in the process, bring summer to a close, Richmond said. After Labor Day, most adults feel like it's "back-to-school" mode, whether they have kids or not, and they're trying to "get their heads screwed back on," Richmond said. It's a busy time of year for the professional organizing business. "People need help getting back into that grounded mindset," Richmond said. Here are some tips from experts to help you transition from the summer holiday mindset into a productive fall. 1. "Drain" your summer brain by making a list. People's minds "naturally settle" during summer vacation, Richmond believes. While that's a good thing, it means we need to "find the on-switch" to get back into the swing of things. But first, use a dimmer, she advises, which means make a list. "It's the old draining the brain technique," she said, suggesting you sit down and write down all the projects you meant to do before vacation or the projects that are coming up. "It's amazing how that takes the anxiety down as the first part of an action plan," she said. 2. Learn to reconnect to your routine and to your house. When Richmond returns from a vacation, she likes to walk around her house and "say hello" and "reconnect to the energy of the rooms." "Little kids do this all the time — it's OK to personify things, like, 'Hey, how you doing? You're the chair I sit in during winter on long nights." It's also important to reconnect with your home desk or wherever the family keeps the computer and sit with your daybook or computer calendar and remind yourself of when to pay the bills or other accounts. For parents with school kids, she advises to reconnect with the kitchen and the morning routine of preparing kids' school lunches. "It's sort of mundane," Richmond said, "but it's anchoring where you do the day-to-day." Many pros advise tackling desk areas in order to feel productive. "From home offices to work areas, beginning the month of September with a clear, organized desk will help put you in the mind set of clarity you will well need to achieve all your goals for the season," said Rebeca Mosher, of Space Composer, a professional organizer whose tagline is "bringing harmony to your world." "Keep in mind that when you free your space of unnecessary clutter you are allowing for better things to come in to your life," she added. That's what a client of Richmond's found when he wanted to reorganize his home office. The Park Slope photographer was branching out into the blogging business and instead of "adding another layer" to his office, realized it made more sense to get rid of his old photo course notebooks and "intro to photo" books he no longer needed. Maeve Richmond, of Maeve's Method, helped New York City sisters Gwynne and Devyn organize their room. "He let go of all that stuff and free up space for the new," Richmond said. "It was like adding a new room." Since New York apartments tend to have limited closet space, it's helpful to "go seasonal" and switch clothes seasonally from your closets into storage, whether its under the bed, on top of the closet or in a storage unit, Mosher said. Now is the time to begin to get those fall clothes and shoes out. "Leave space for a small portion of summer stuff and, while you are at it, this is the absolute best moment to do some serious editing of both your summer and fall wardrobes," she advised, bluntly stating that it's time to reconsider any items that "haven't worked out for you" for the last three summers. Doing this will make it so you don’t store more than you should," she said. 5. Re-evaluate your storage unit. If you rent a storage unit, odds are that you are storing things you haven't needed in a while, said Mosher, who believes most people don't even remember what's in their units. "Pare down its contents into a smaller unit or, even better, to no unit at all," Mosher advised. "By incorporating into your regular space items you really will use in your everyday life and getting rid of the rest, you’ll be saving on that monthly payment which, when added up at the end of the year, is a nice chunk of money you could use for something else." It's also a good opportunity to make better use of storage units by clearing your living space of seasonal items "and/or memorabilia," for instance, "so you can enjoy a clutter free environment," she advised. 6. Get your kids involved. It's a good time to edit kids' toys, artwork, old school supplies and other objects as a way to make space for what will come during the new school year, the experts said. But it's critical to get your kids involved — even toddlers, noted Richmond, a former preschool teacher who enjoyed helping 2-year-olds learn to take responsibility for their environment. Rather then tell kids to do chores, Richmond advises parents to ask their kids to create a space in their rooms where they can put the stuff they need for school. "New York City kids are amazing and creative because they live in such small spaces," Richmond said, adding that involving them in making these spaces "empowers kids to take part in their own routine." Mosher advises clients to turn things into a fun game where you lay out different boxes with color labels such as “things to keep,” “toys I still play with," and “Give away to other kids." "I guarantee you that you’ll be surprised with the results," she said, "and by the time your kids become teenagers you’ll thank yourself for introducing them to the wonderful world of ‘keeping your space organized.'"